Of late, my Shakespeare class has been spending some time on the collaborative The Witch of Edmonton, Shakespeare's The Tempest, Robert Greene's Friar Bacon and Friar Bungay (pdf), and Marlowe's Doctor Faustus. These plays all include magical characters - Mother Sawyer from Edmonton, Prospero and Ariel from The Tempest, the two Friars and the German magician from Greene's work, and the lamentable Faustus. And amid discussion of allegories and stagecraft, it occurred to me that the medieval idea of magic existed in a state almost identical to that of the drug trade in the modern world. Illegal drugs are our magic, and junkies and dealers are our witches. My thoughts on the matter began with some comments about The Witch of Edmonton by a guest lecturer, doctoral student Hannah August. A great deal of the focus was on how magic worked in the play and how witchcraft was viewed at the time, and we spent a couple of hours reviewing the Malleus Maleficarum (a medieval "guide" to witchcraft), a history of witchcraft in England, and some secondary criticism by Anthony Dawson. Dawson brought to light the class conflict in the play. For those not familiar with this lesser-known work: at the start of The Witch of Edmonton, we see a Mother Sawyer who is on the fringe of society. She's an old widow, poor and bent, and persecuted by her neighbors. The local lord has even refused her the traditional village charity of allowing her to gather sticks on his land (to make and sell brooms), cursing and beating her. She is innocent, but still called a witch - so she reasons that she might as well have a witch's power. She curses God and makes a pact with a devil. Naturally, it doesn't turn out well for Mother Sawyer. Her devil doesn't actually do her bidding, and she is imprisoned and executed for crimes she may not even have committed. In the play, her fate is contrasted with the spoiled child of a local landowner, who secretly marries a chambermaid when he thinks she's pregnant, but to please his father and keep his inheritance later marries a second woman - and then murders her once his succession is assured. While Mother Sawyer dies in spite and hated by all, this scion of wealth is forgiven and dies beloved. It was probably not an intentional contrast, but to the modern reader it's startlingly obvious just how unfair are the results of this system. Dawson's pertinent article, "Witchcraft/Bigamy: Cultural Conflict in the Witch of Edmonton," points out that Mother Sawyer is just like all "witches" of the time - she's a woman and she's at the bottom of the class system. Because witchcraft is a crime that has a moral taint about it, and cannot be disproved to anyone's satisfaction, this means that those people at the very limits of society, poor women, were essentially in an extralegal position. Witches were a social safety valve. On the one hand, they provided for a traditional need for hedge magic, allowing people to get their love potions and their abortofacients. A villager in need of a tea to relieve cramps or a hex to attack a neighbor had to have somewhere to go, after all, even if the letter of the law and official teachings make any sort of magic illegal. But on the other hand, the system allowed them to be safely and easily eliminated in time of need. If the village needed a scapegoat or if someone important just decided they didn't like a poor old woman, then she could be accused of witchcraft and gotten rid of. You can't disprove witchcraft when you're of the "type" seen as a witch. Being poor and old and alone meant you were already guilty. In The Witch of Edmonton, Mother Sawyer goes to her execution unlamented. Why should anyone care, after all? She was already guilty of being what she was, and contemporary audiences would have found only a little poignancy in her early declaration that "Tis all one / To be a witch as to be counted one": a frank admission that since she is already being treated as a witch, as a woman beyond the protection of the law or assumption of innocence, she might as well call up the devils. By now, with my earlier thesis in mind, you probably have already made the same connection I did. While the sexism has dimmed slightly, those people involved with the drug trade have assumed the same role that those involved with magic once held. They're liminal figures, safely accused and in many ways beyond the protection of the law. They meet the needs of society as a pressure valve, providing goods and services that the majority want to be available, but their position is carefully maintained to keep them in the position to be discarded at need. I don't want to be alarmist here. I don't want to lose sight of the fact that witchcraft does not in fact exist and that the "witches" of history were condemned for something they did not do, whereas drug-runners and the like often did do what they are accused of. Nor am I saying this is the only analogous situation, since other things like prostitution or illegal immigration might also suit - they're also liminal elements that are made available but extralegal. It just seems to me that the drug trade is the best match, and the most compelling. And there's a lot of evidence. The various magical figures in the list I gave at the beginning (Prospero, Mother Sawyer, the Friars, Faustus, etc.) all break up into a few categories, and these correspond with segments of the drug trade today. These figures, like Friar Bacon, Faustus, and Prospero, are all educated and wealthy men. They work their magic by summoning imps and demons, creatures wholly belonging to the magical realm. And in the end, they either abandon their ill-deeds ("Now my charms are all o'erthrown, / And what strength I have's mine own")- or else they are cursed into Hell. These magicians tend to have distance from the magic. They engage in complicated rituals of summoning, but their creatures do the vast majority of actual action. Ariel flits around and puts people to sleep and whatnot, Briar Bacon's spirits transport people back and forth, and Faustus has the obliging Mephastophilis to do all kinds of nonsense. This keeps the magicians' hands relatively clean; while they are still "doing magic" in some legal sense, the distance between themselves and the action makes them white-collar magicians. 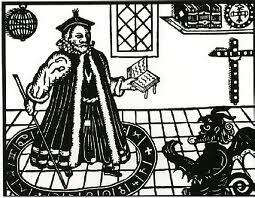 At times, this is particularly evident, like when Mephastophilis gives Faustus a magical book that can perform all manner of enchantments - a book that he never uses, preferring to let his demon familiar do all the summoning of chariots and raising of Helens. These characters are notable for the fact that they can escape from the dangers of magic, even after benefiting from it. Prospero breaks his rod and drowns his books well after the point where he's used his magic to solve all of his problems. Bacon decries his dark arts and returns to Christ after coming to the attention of kings and raising his status considerably. Faustus is the exception that proves the rule: he came very close to getting twenty years' of awesome pleasures and still welching on his deal, but in the end lacks the moral fortitude to repent. He could have gotten free, but he refused. It is not a hard task to see these men as the upscale drug users and pushers: the actors who snort a few lines after a show and the Howard Markses of the world who move briefcases of hashish. They're distant from the crime and it doesn't consume their lives, and so they are generally privileged enough to be able to escape from most consequences if they're caught. It's not unless some of them get too pulled in that they seriously crash to earth. I'm no expert on drugs or drug dealers, of course, but even if this doesn't exactly reflect the reality of the matter (maybe way more big-time dealers go to prison than I think?) then the perception remains, and in this case the perception is the important thing. In Blow and Scarface and so many other films, downfall only comes from getting too involved with the sin of drugs. If you stay respectable and stay dignified and stay upper-class... well, then you're fine. You do five years and write a bestseller. 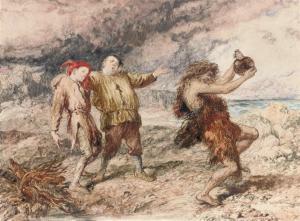 Faustus' servant steals his magic book. A clown who's near Mother Sawyer makes a deal with her devil-dog. Friar Bungay hopelessly bumbles through his cantrips. They're dabblers. It's important to note that they're not the upper class. They're lower-class and uneducated and usually some sort of low entertainment for the groundlings - the Elizabethan equivalent of the Three Stooges. They appear in interludes that are usually beside the main action, and often in secondary plotlines. They're of low virtue and we have low expectations of them, and so they provide good fodder for comedy. Often their scenes were varied by the actors, who would ad-lib lines or perform tricks to spice up a dull performance. They were not serious, above all. Because they were not serious, it didn't much matter what trouble they got into. It was mischief, not sin. Oh, sure, they met with unfortunate consequences or had hilarious mishaps, like ending up with donkey's ears or getting their bottoms burnt with fire or being humiliated before the king. But even when one of them goes to Hell, as in Edmonton, it's to go operate a tavern for devils, roaring with laughter all the while. They might be sinning, but it was winked at because they were seen as harmless. It isn't too far of a leap to see most drug users in this same instance. If you just smoke a little pot or roll at a rave, then for the most part it's not going to be a big deal. That's why we get movies like Harold and Kumar Go to White Castle or Half-Baked, where the clowns have the stage the entire time - they suffer a few problems from their drug use, but it's winked at. No one wants to see a guy endure permanent consequences from a joint, after all. To some extent, it seems like we've made some progress. Even though the drug culture still tends to be harder on women, male junkies are often even more reviled. So to some extent, the gender bias has retreated when it comes to the liminal elements of our society. More and more, it's an equal-opportunity problem. Both witches and junkies are on the fringe, and their status as "witch" or "junkie" is a fluid one - in many cases, it's enough to just be accused to have that social stain. Society tolerated magic among the high class, but expected it of a certain sector of the populace. If you were a poor lonely woman, then you were beyond the bounds of innocence, in that extralegal place where the assumption of "witch" status was a convenient way to eliminate a threat in time of need. As the manor system of feudalism began to break down in the seventeenth century, the traditional values of charity that had maintained communities came under strain. The feudal lords were no longer seeing serious returns on their land as reforms took hold, and so they increasingly began to slack in their duties - which in turn encouraged more reforms. So Mother Sawyer is beaten by her lord at the beginning of The Witch of Edmonton, because he is both a brute and sees no reason to provide charity when his own coffers are dry, and she finds herself without recourse. Mother Sawyer is locked out of all possibilities, pigeonholed as a witch because of who she is, beaten and bent. It's only natural that she turns to real witchcraft and calls up a devil. The poorest of our people are in much the same position. Social programs wax and wane, but they tend to vanish during hard times and only partially return during economic booms - the net results are crumbling projects, schismatic school districts, and pennies' worth of food stamps. Drugs are perceived as one of the few ways to escape, either by dealing or by recreational use. And too often the poor endure suspicion of such wrongdoing, no matter what they've actually done. Is it any more surprising that they indulge? I'm not saying that junkies are always the victims of unjust accusations, like witches were. There is no such thing as witchcraft, but there definitely is such a thing as heroin addiction. But I am saying that just as witchcraft served a function to eliminate the liminal at convenience, so too can the imposition of witchcraft status. Just like magic, it's a social safety valve. And it's one we should be careful with. If we're not careful, then a behavior we condemn taints an entire class of people with a label that can be applied or dismissed at will. It puts them outside the law, beyond the succor or true condemnation of justice. They're just poor and ragged and available. It's a slippery slope, and one to watch.